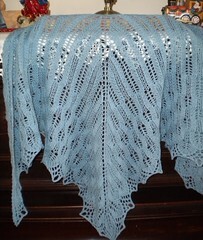 Knitting Relaxes Me: Happy New Year! I didn't really plan on being gone for almost two weeks, but you know how this time of year is! The library was closed Dec. 24-27 and Jan. 1, and I took Dec. 28-31 off. The original plan was to go to San Antonio for Christmas at my sister's but circumstances got in the way and instead, we had Christmas at my mom's house in central Illinois. My sister even came up for a week (yay for Southwest Airlines and affordable airfares - and free checked bags, too!). and a small-sized Bitterroot for my sister. I didn't quite get this done before Christmas, but I did get it done before I left Mom's. I didn't use beads on mine - that would have slowed me way down! 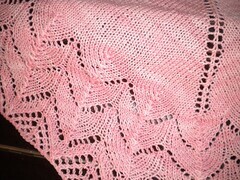 As it is, I'm impressed that I got this done in just over two weeks -- work really gets in the way of knitting! 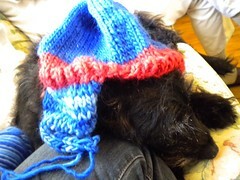 There was also the "not quite Jayne" hat in Tennessee Titans colors for my brother-in-law, shown here modeled by my mom's dog Blackie. In reality, the colors aren't quite so eye-searing but this is the only picture I have of it. 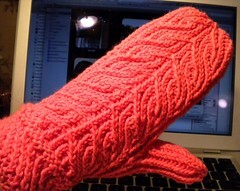 There's also a pair of flip-top, flip-thumb mittens for my brother. I've finished one prototype mitten, and will be making a pair based on that, with adjustments based on my brother's actual hand size as well as things I learned while making the prototype. Photos will follow. 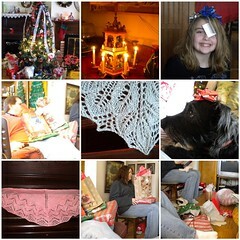 In the meantime, here are a few more pictures from Christmas. Oh wow! Your bitterroot is beautiful! Wow, you sure knit a lot of gorgeous gifts! 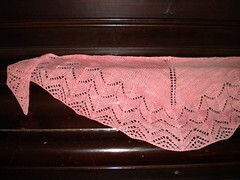 My shawlette IS gorgeous! I am just constantly amazed at my sister's talent. Thank you, Janna! Oh, and my husband LOVES his Jayne-esque hat and has worn it every day since I got home. Sometimes I catch him wearing in the house, just for fun! 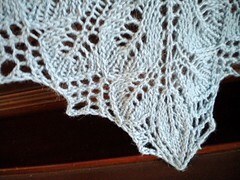 Your Bitterroot makes me want to knit one! Man, you got busy with the knitting this holiday season! Really like those mittens.